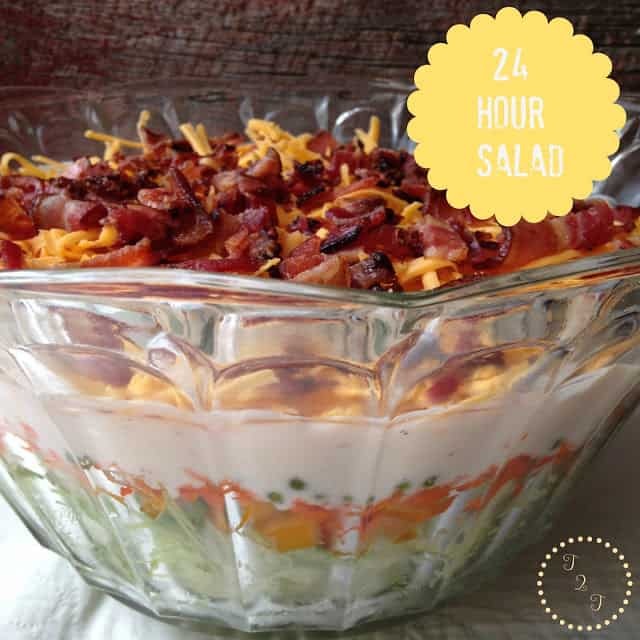 Seven Layer Salad…Overnight Salad….24 Hour Salad…Twenty-four Hour Salad. This salad goes by many different names but whatever the name it goes by..It’s delicious. 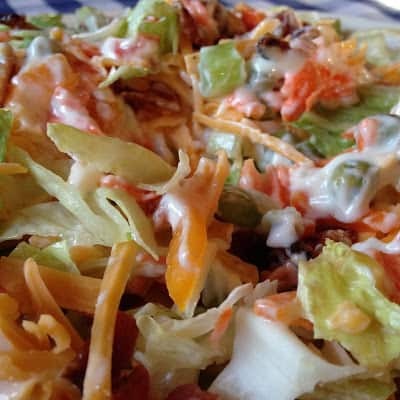 It’s the perfect summertime, make ahead salad that everyone seems to love, even kids! 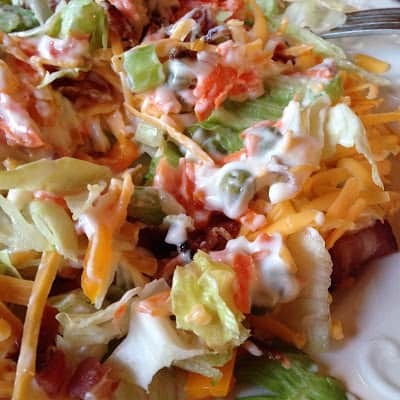 Twenty-four hour salad is the perfect salad to bring along to your upcoming 4th of July celebrations. 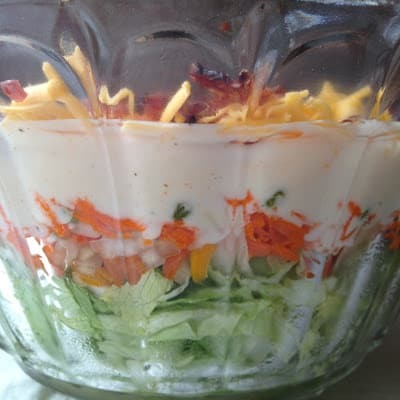 Twenty-four hour salad looks great served in a large glass bowl or even better yet…an old, inexpensive punch bowl found at any thrift store or at your local Goodwill store. You might even come across a punch bowl at a rummage sale, if your into that sort of summertime activity. I bought my super large, glass punch bowl at Goodwill a few years ago (without the cups) for $1.99. Mix together mayo, sugar, vinegar, salt and pepper. Set aside. In a large glass bowl, layer vegetables in order given. Spread mayo mixture over the top and spread mixture to the edges of the bowl to seal. 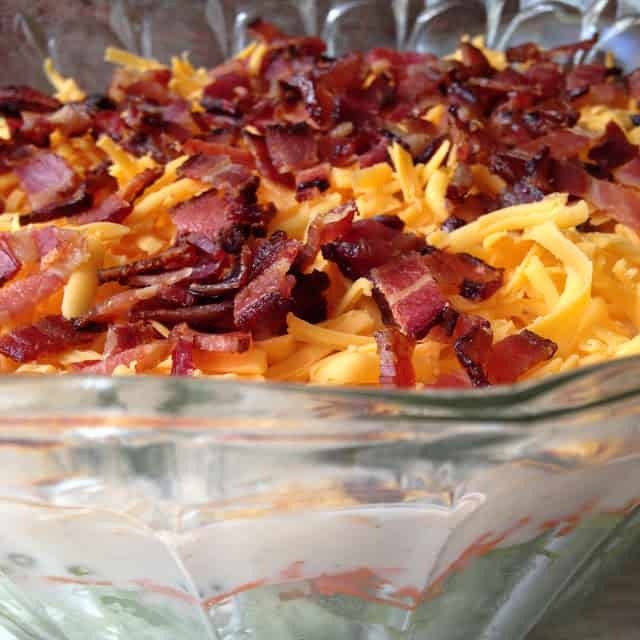 Sprinkle with cheddar cheese and bacon. Cover bowl with plastic wrap and refrigerate overnight or up to 24 hours. This is such a good recipe. Simple ingredients, but in the right order they are delicious. Thanks for sharing this. And a 1.99 bowl is a great buy!